The Hacking Washington campaign has stoked enthusiasm — and concerns. The idea was established last year as part of the city of Spokane's strategic plan: The city would spend $250,000 to promote the greatness of Spokane to the west side of the state. But by the time the #HackingWashington ad campaign finally launched, the price tag had risen to nearly a half a million dollars and involved three different marketing firms. The reaction from some people has been positive. "It may well attract businesses and other Seattle refugees here," Spokesman-Review columnist Shawn Vestal writes. "But even if you’re here already, there’s plenty you could learn about Spokane’s current cultural moment by browsing hackingwashington.com." But it also has sparked messaging concerns, hashtag complaints and conflict-of-interest ruminations from City Council members, activists and even from some of those involved in parts of the campaign. Benji Wade, who founded Treatment, one of the three firms involved with the campaign, says he's sometimes had doubts about the hashtag. "I myself have been wildly inconsistent and have gone back and forth," Wade says, about the #HackingWashington hashtag itself. At times he's liked the hashtag. But at other times, he's shared some of the doubts about it heard elsewhere. 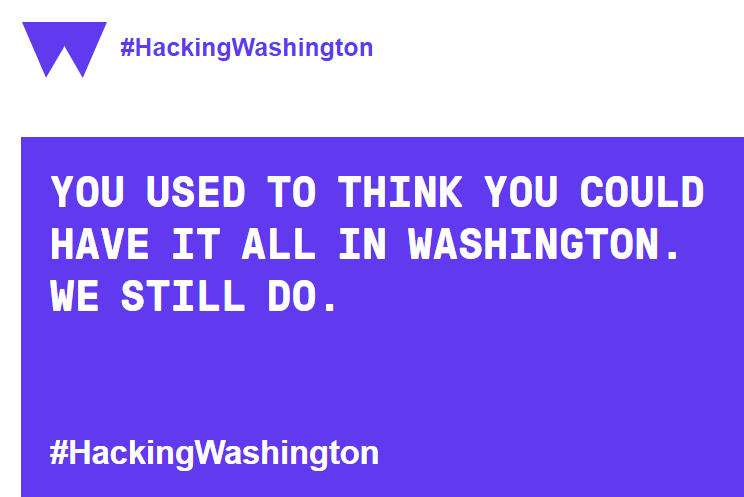 Some in the community have complained that the "#HackingWashington" hashtag is confusing. They've questioned whether it's a good idea to spend marketing money to get rich people to move to Spokane. They've raised issues about conflicts of interest. They've wondered why a site intended to promote Spokane features pictures of Los Angeles and Seattle on its landing page. "I talked myself out of my own potential cynicism a lot," Wade says. "I’m still trying to be mindful that, like, I really want this to really work out really well." Treatment's proposal for the campaign argued that they were well-suited to tell stories about artists. Part of the complication is that the campaign ended up merging two messages together. The hashtag #HackingWashington, and the resulting website design, came from advertising firm Chapter & Verse. "We tell a story that raises eyebrows. That story centers around people and businesses that have figured out how to hack Washington," the Chapter & Verse pitch explains. And if the hashtag sounded a bit strange or provocative, well, that's the whole point. "What is #HackingWashington? There’s a feeling among people who’ve moved to Spokane," the pitch reads. "It’s almost like they’re getting away with something." Their pitch was foremost a financial argument: Look at how much further your Seattle dollar can go in Spokane. Imagine spending only 12 minutes a day commuting. Look at what kind of gorgeous house you could get with Spokane prices — you'd have enough left over for a lakehouse. Another pitch, made by two firms, Quinn and Treatment, aimed to show just how many cultural benefits Spokane had, without of lot of the drawbacks of the Seattle region. That pitch was foremost a cultural argument. "Our hook is the revelation that they don’t have to sacrifice culture, arts and environment," the Quinn/Treatment pitch reads. "There is another city with tree-lined streets and classic architecture and a thriving arts scene with passionate sports fans beyond the Seattle area." Both firms presented before the city's selection committee — composed of Council President Ben Stuckart, Councilwoman Lori Kinnear, Spokane Chief Financial Officer Gavin Cooley, former city utilities director Rick Romero, then-city spokesman Brian Coddington and city business development manager Charlie Wolff. Some on the selection committee, like Stuckart, really liked Quinn and Treatment's pitch. Others, like Kinnear, really liked Chapter & Verse's pitch. So the committee decided, why not both? The city merged the two proposals, spending $450,000 over two years on a hybrid proposal: Chapter & Verse was launching the website. Quinn would be focused on digital ad targeting. And Treatment wrote stories and produced videos focusing on the cultural and business highlights. But even before the campaign launched, there were concerns about the branding effort. What does #HackingWashington mean? And does that question work in the campaign's favor? Here's the Washington State Wire last week, writing under the item "#Hacking Washington: Not Quite What Spokane Wanted?" "I live in a city where the air quality is so bad I cough all the time!" Spokesman-Review reporter Nick Deshais joked on Twitter. City Council member Candace Mumm expressed some of the same concerns: Yes, hacking can mean life-hacking. But it can also mean computer hacking. One of the most recent news stories to pop up when you search "Hacking Washington" is this Seattle Times story about the prospect of hackers trying to hack the Washington election system. You don't want somebody interpreting #HackingWashington as a sort of challenge. "It’s a term that has multiple meanings," Mumm says. "I want to make sure that we’re clearly communicating the good things about Spokane, and not having folks misinterpret the term 'hacking.'" Mumm says she's raised specific issues about the campaign in meetings with the city administration. "I wanted to have a discussion with the rest of the council and the marketing professionals that are managing this campaign and express my concerns," Mumm says. Jeff Sanborn, founder of Chapter & Verse, argues that the way the campaign was presented, in context, made the idea of what they're going for clear: That living in Spokane is the ultimate life-hack. But because of the negative reputation Spokane had on the west side, they wanted to pique the interest of west siders with a campaign that highlights all the Spokane's benefits before revealing that they're talking about Spokane. "For so long, simply saying the word Spokane, simply closed the door in Seattle," Sanborn says. "We wanted to keep the door open as long as we possibly can. " Sanborn did, however, say that Treatment co-owner Luke Baumgarten raised concerns about the hashtag. Wade says he hasn't heard from the campaign's target audience on the west side, but has said that he's heard mixed things locally. "I heard from people who thought it was clever," Wade says. "And I heard from people who were confused by it and didn’t understand it." He does, however, suggest that the initial burst of confusion can actually be good for the campaign. "The misperception that it can be a cybersecurity thing can work for its benefit," Wade says. "It adds another layer of cleverness." "I was immediately offended when that hashtag came out," says Councilwoman Kate Burke. "Everybody I've told about it has been disgusted about the hashtag as well." For Burke, who has established herself this year as the most radical member of the council, the problem wasn't just the hashtag. It was most of the campaign. "It’s insinuating that if a Seattlite were to move to Spokane, they would be able to stretch their dollar further," Burke says. "I think it’s disrespectful… They're not portraying our community in a positive way." In particular, she says, she was bothered by the ad bragging about how you could buy a "4BR house in the city and another on the lake." "I just feel like saying 'Hacking Washington' means that everyone in Spokane is doing well," Burke says. "The majority of our population that I serve is not doing well." Look at our free or reduced lunch rates among our kids, look at our poverty and the homeless issues, she says. To her "an invitation for rich people to move here" was "disrespectful to the people who currently live here that are struggling to make it by." More rich people moving here, she argues, will make things worse for her constituents. "It's only going to clog up the vacancy rate even more," she says. Sanborn stresses that the intention of the campaign is to talk to business leaders, some who may be struggling to afford $900,000 "starter homes" in the Seattle area. "They're not wealthy people," Sanborn says. "That’s just the cost of living." The appeal is showing the broad advantages of the Spokane area, one not constrained by traffic, crowding and sky-high real estate prices. A few months ago, Baumgarten called Burke to talk to her about her concerns. "I share a lot of the concerns about the housing situation, the homelessness, all of that stuff," Baumgarten says. 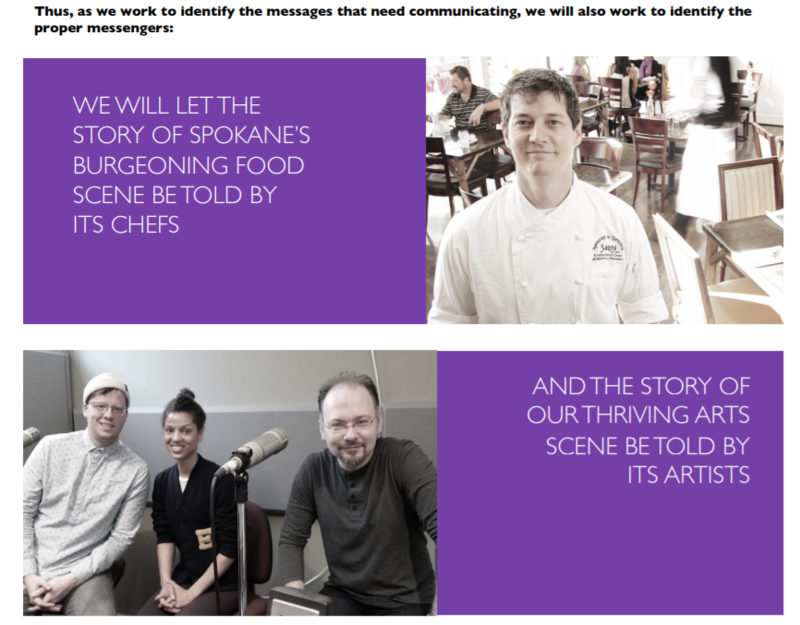 "We're going to market Spokane to the west side, I want to market Spokane in a way to show how hard we're working here to not become another Seattle. To not become another place where explosive growth pushes people out... It's not that we're going to be able to stop the flow, but can we guide it?" But ultimately, Burke wasn't persuaded. She voted against the proposal. "This goes against my morals," Burke says. "I don't believe searching for other businesses to move to Spokane is the way to build our economy... We could have spent $500,000 investing in our local businesses right now." It wasn't just Burke. From the beginning, people on the left have been skeptical of the campaign. "Doesn’t make sense to push people to move here when we have a housing shortage that is making the homeless crisis worse," 6th District Candidate Jessa Lewis wrote on Facebook. "I could think of better ways to spend $500K." At Monday's City Council meeting, activist Alfredo Llamedo echoed Burke's arguments. "When you spend 500 grand to advertise to Seattle... are you also putting a little tagline on there about our problem with homelessness?" Llamedo says. "Are you also putting a little tagline on there about the vacancy rates in this town. Or how difficult it is to get into an apartment unless you have perfect credit. I'm sure that's part of it. No, it's just cheap real estate. Come to Spokane. Screw the people who already live here. They're not important." Something else raised eyebrows in the community. As the campaign rolled out, Treatment began posting reported stories about great things in the community. 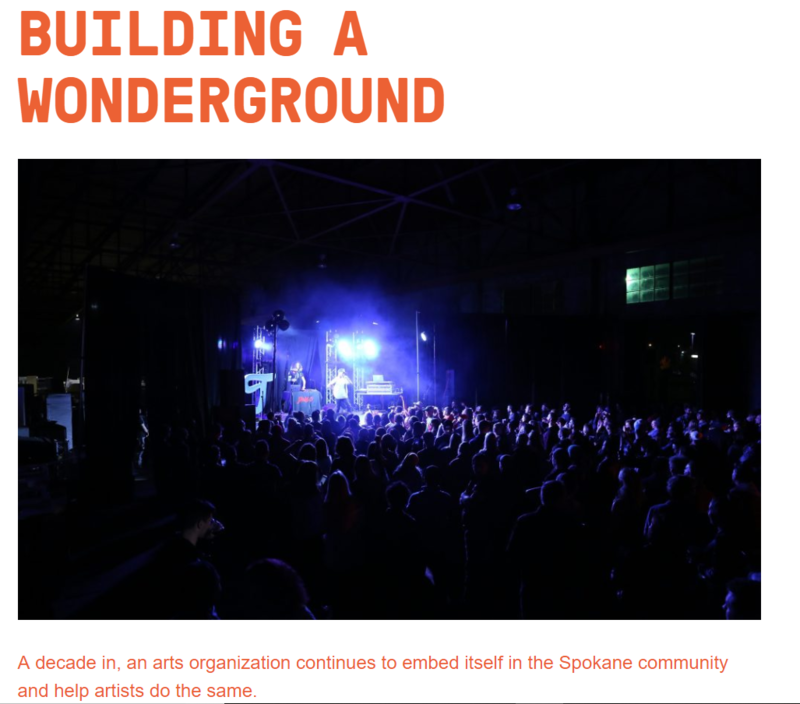 One of those first posts was celebrating Terrain, Spokane's annual art and music festival. 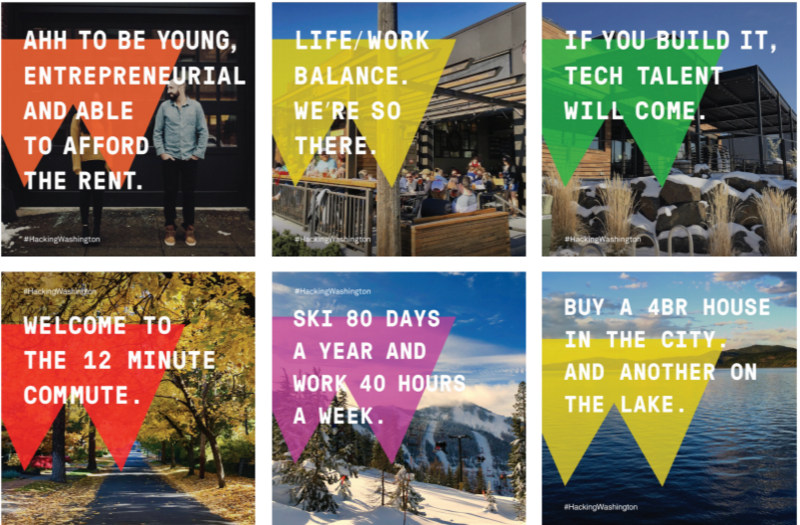 That post had been assigned and edited by Treatment's Luke Baumgarten, a board member and co-founder of Terrain. Not only that, but City Council President Ben Stuckart had been one of the most ardent champions of Treatment's selection to be a part of the campaign, while simultaneously serving as a Terrain board member with Baumgarten. In fact, from the council dais, Stuckart chided other council members who were skeptical about spending the $450,000 on the campaign. Was this, effectively, a Terrain board member using public funds to pay another Terrain board member to promote Terrain? But neither of the council members on the selection committee saw that as a conflict of interest. Stuckart noted that he doesn't get paid by Terrain, that there were six other members on the selection committee and that, today, the #HackingWashington campaign is promoting all sorts of different things. "Treatment is totally separate from Terrain," Stuckart emphasizes. And yet, from the council dais, Stuckart pointed out the advantages of Treatment's connection to Terrain while awarding them money. "Through their involvement with organizations like Terrain and businesses like Fellow Coworking, the team at Treatment knows the story of Spokane’s recent growth better than almost anyone because they’ve been helping to build that success, with their sweat and their passion, every day for the last decade." Baumgarten says that he didn't write the Terrain article — one of Treatment's other employees did. He says he presented a list of events or topics to the city of Spokane, and that then-city-spokesman Brian Coddington recommended that Terrain be one of those stories. "I recognize that there’s a finite pool of coverage. Just in the same way there's a finite pool of money. I try to be as ethical and diligent and, ‘hey, is this OK?’" Baumgarten says. "We're going to try to tell 18 stories over the course of the next 18 months. Probably six of them will be in the arts realm." To not write about something as cool as Terrain, Wade argues, would be hurting the campaign. Yet, even some of Terrain's former board members, like Diego Sanchez and Brian Estes, raised concerns about how Terrain's prominence on the Hacking Washington page looked. "That was the opening salvo of the presentation of what’s exciting about the arts in Spokane in the #HackingWashington campaign," Estes says. An organization with "that level of influence and sway," Estes says, "should be concerned about those types of questions about conflicts of interest," suggesting that "more time spent on the artists themselves, or just the other activities or efforts in the community — that’s the crux of that campaign." Some people have questioned why photos of Los Angeles are featured on the website. "I had wanted to make sure that we were showing, not just men in business, but women in business. Not just white people in pictures, the whole diversity of Spokane should be represented," Mumm says. "The initial pass I saw, I felt like we could do a better job [of representation] whether its race or gender." But as of today, Wade and Sanborn point out, the landing page features more diversity. But there were other questions. 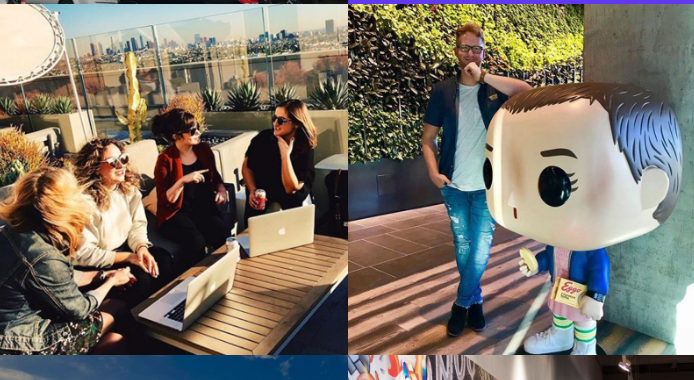 Such as, why were several of the pictures on the landing page of the site intending to promote Spokane featured several pictures of Chapter & Verse employees visiting Los Angeles and Seattle? "This doesn't look like Spokane," 6th District candidate Jessa Lewis writes on a screenshot of the Hacking Washington page showing the employees visiting Los Angeles. "The whole campaign confuses me." The original intent, Wade and Sanborn say, was to show that because of Spokane's great cost-of-living, employees get to do cool things, like travel. "We wanted people to be able to share the lifestyles we live," Sanborn says. "This company gathering is part of our life." Wade says the people involved with the campaign have talked about changing it. Through all this, Wade keeps in mind that, as a local person, he's not a person the ad campaign is trying to target. "I care so deeply about Spokane," Wade says. "I'm going to be protective of it." Same with local council members, politicians and cultural leaders. They already love Spokane. The people they're trying to convince don't. "I am not the market," Wade says. And, if you're reading this in Spokane, it's likely you aren't either.